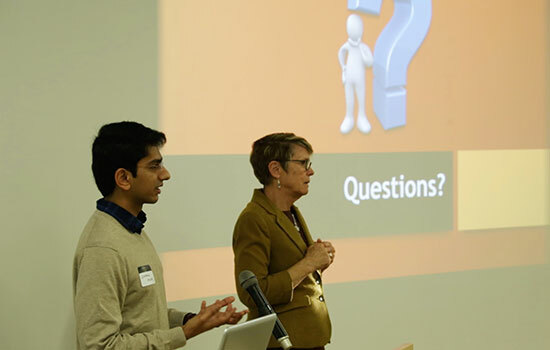 Chirag Kular presented his research at the second annual Frameless Symposium, hosted by RITâ€™s MAGIC Center. Chirag Kular is a master’s student in the computer science program who is working on an innovative research project using augmented reality technology. Kular is working on a capstone project that is incorporating the technology of Microsoft HoloLens, Amazon’s Alexa and IBM’s Watson to make an efficient working assistant. 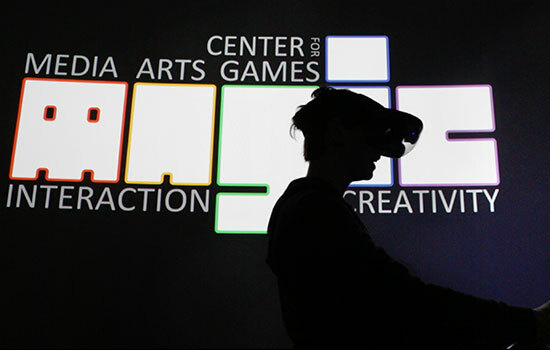 On Dec. 1, Kular presented his research and findings thus far at the second-annual Frameless Symposium, which is aimed at highlighting research and innovation that uses frameless mediums, such as augmented and virtual reality. Traveling from Mumbai, India, to finish his graduate education, Kular has always had an interest in technology. He enjoys developing new applications and working with programing to find new, innovative uses for technology. When he isn’t working on his research or classwork, Kular likes to relax and spend time with his friends. Question: What brought you to RIT? Answer: I always wanted to pursue higher studies after I got my undergraduate degree, but I knew completing the master’s degree applications and the degree program itself was going to be expensive. So after my I got my undergraduate degree I got a job and worked for a couple of years. While I was working, I was studying and preparing for the entrance exams and I saved money for the application fees, so when the time came I was able to apply to several schools. RIT accepted me, so that’s what brought me to RIT. Q: What about frameless technology like augmented and virtual reality interests you? A: It all started during an internship I had with MatrixCare in the summer of 2017 when I was asked to work with Microsoft’s HoloLens. From there I developed an interest in HoloLens technology and development and I decided to do some further research into it. While I was researching, I came across a lot of interesting projects, and when I was trying to figure out my capstone research, my adviser asked me to continue looking into the projects that interested me. Now I’m using augmented reality technology for my capstone research project. Q: How do you feel this kind of technology can enhance our lives? A: I would say any professional working in any field can benefit from this. If someone doesn’t understand a certain concept and they are wearing this augmented reality device, they could easily look things up and have it projected onto the device using voice interaction. The information they need would just pop up into their field of view, just floating in front of them. It will make it easier for people to get information they need, and maybe even help them do their job faster and more efficiently. You can look at cool movies like Iron Man and see how this kind of technology helps him in his home, and we are kind of moving toward that. Q: Can you tell us about the research you presented at the symposium? A: During my internship with MatrixCare, I was working on a proof-of-concept and I was researching many different projects to see how HoloLens could be implemented in new and different ways. I came across one project that was presented by TechCrunch where they integrated Amazon’s Alexa inside the HoloLens. I liked that idea and I was curious about how they could have done it. For my project, I am integrating Alexa and IBM’s Watson tone analyzer, which can detect emotions of a sentence. You can pass a sentence through Watson and it can display a score for a particular emotion, like happiness or anger or disgust. So what I’m trying to do is integrate Alexa inside the HoloLens and ask Alexa to get some data from daily news websites. Then, the device will put the news article through IBM’s Watson so it can figure out the tone of the particular article. After this process is finished, Alexa can then tell the HoloLens user the tone of the news article so the user can decide if they want to read or use it. Q: How did you come up with this idea? A: When I was at my internship, my manager brought the idea of doctors wearing HoloLens to my attention. He presented a scenario that interested me. A doctor wearing the HoloLens walks in to see a patient and without looking at their chart the doctor can access the patient’s information wirelessly in the augmented reality world and easily read the information to figure out what treatment that particular patient may need. Basically, this would be an interaction with a hologram inside the HoloLens. I looked up different projects on the internet to see how this could be developed, and from there I came up with my own idea. I also drew ideas from the TechCrunch article that I mentioned before. Q: Any advice for people who want to start doing research in frameless technologies? A: To get started, you always should go to the beginning and look at the programming documentation of how different technologies are developed. Look at the new technologies that are coming out, they always have their documentation and tutorials on their site. That is the best resource to get started on working with augmented reality technologies. HoloLens has a lot of good lessons to learn from on their website and this can help you get started with their technology. The difficult part with working on new technology is that if you get stuck with some error, there are very limited resources to figure out the solution. So I kind of struggled a lot through this project, and others working with this sort of technology will too, but it is worth it. Felicia Swartzenberg compiles “Student Spotlights” for University Communications. Contact her at fds9410@mail.rit.edu with suggestions.